I have always handled my own migrations, but usually the store has offered to do it and never mentioned a fee whether or not I’ve had AppleCare. Maybe I’m missing something, but hasn’t Apple offered “Migration Assistant” free for many years, or is this a different type of service? This is an Apple employee, at an Apple Store, doing the migration for you. Presumably they use Setup Assistant (which runs during initial setup) and is basically the same code as Migration Assistant (which you use later if you didn’t migrate data at setup). It’s pretty easy, but lots of people aren’t very technically experienced and find it intimidating. Setup Assistant calls on Migration Assistant, so it’s exactly the same except for the way it begins and ends. 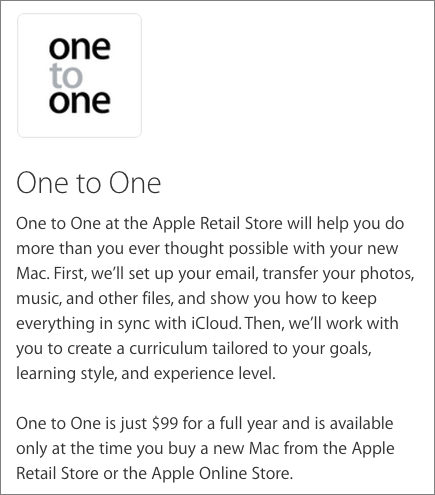 Previously, you could pay Apple $99 per year for the One to One program, and that included data migration along with training. That program is now defunct. Plus, the data migration service was also free for a while just prior to the “I’m a Mac, I’m a PC” ads, and I imagine that Apple employees have also had the leeway to waive the charge in individual situations. I was curious if there was any connection to the current Personal Setup program, but no, there isn’t. Personal Setup is designed to help people who’ve just bought a Mac, iPhone, iPad, or Apple Watch get set up and running right away. It might include some configuration and a little data transfer, such as of contacts or email settings, but isn’t meant to be a full migration. Sorry. I bought a new Mac and, yes, they did not charge me for the migration, but they only migrate their apps, not what you have on your hard drive from your old Mac. For that I had to go to MacMedics and since the Mac store could no get my mail to work I ended up paying $199 for a complete migration and for the time it rook them to get my email working. I have been a Mac person since 1984 and this last purchase was the worst experience of my life. It was the first time I felt the Mac Geniuses were not competent. Very disappointing. That seems wrong from everything I’ve heard—migration by definition involves moving all your data from one Mac to another. Most of Apple’s apps are automatically installed; there’s no migration necessary to get those on a new Mac. It’s too late now, sorry, but you should definitely complain to that store about the service you received. I did complain to store Mgt, and then to Apple directly, all to no avail. I didn’t mention the whole saga, Like inability to access my email on which a genius worked for an hour to no avail. and I was my usual cal, cooperative, patient throughout.